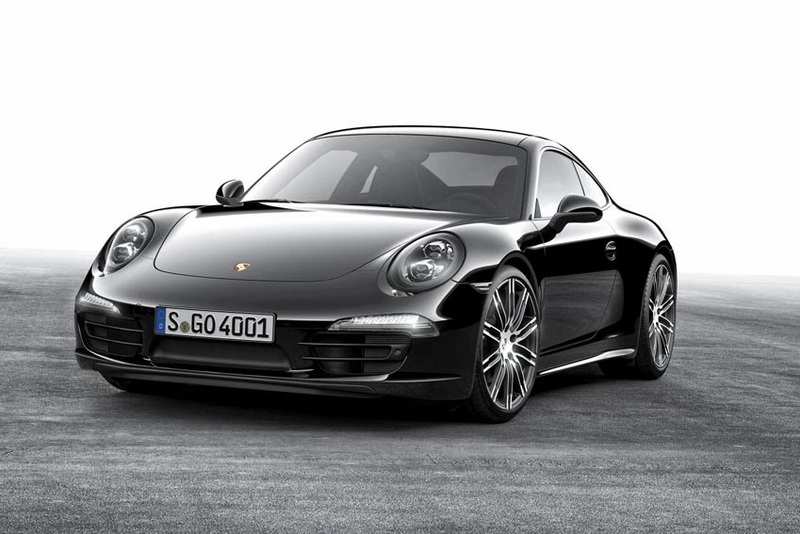 Porsche has created a special series of the 911 Carrera - the Black Edition. since its launch in 1963. Standard equipment on the 911 Carrera Black Edition model includes distinctive 20-inch diameter alloy wheels, automatically dimming rear-view mirrors, rain sensing windscreen wipers, cruise control and Sport Design steering wheel. A rear-mounted, flat-six cylinder engine is a symbolic component of the 911 identity. The 911 Carrera Black Edition is powered by a charismatic 3.4-litre power plant developing 350 hp (257 kW). It is offered as coupe and convertible versions, and with rear-wheel drive or Porsche Traction Management (PTM) all-wheel drive. The special model rides on eye-catching 20-inch diameter '911 Turbo' style alloy wheels and further graphic differentiation is provided by LED headlights including the Porsche Dynamic Light System Plus (PDLS+). The black interior simply looks sophisticated. The driver and passenger sit on heated seats - with the Porsche crest embossed on the head restraints - and the standard Bose Surround Sound System provides excellent sound quality. In addition, the mobile telephone module, front and rear Park Assist, which includes a reversing camera, and '911' rear badge add to the effortless style of this 911. In addition to the special Black Edition features, standard equipment on every 911 Carrera includes leather interior, sports seats, Porsche Communication Management (PCM) with satellite navigation system with 7-inch colour touchscreen, universal audio interface offering MP3 connectivity, automatic climate control, Porsche Stability Management (PSM), Porsche Vehicle Tracking anti-theft system, three year warranty and three year roadside assistance package. The 911 Black Edition models are on sale in Porsche Centres in the UK and Ireland.